Premier League star Steve Cook has agreed to become the Hastings United Football Club academy ambassador. Having grown up in the town and been a pupil at Ark William Parker Academy, Cook is now starring for AFC Bournemouth in the country’s top flight. He said: “I am proud to be involved in the academy at Hastings United. The work that is being carried out in the community to try and give young footballers a pathway through sport and education is fantastic. “I have known (United academy director) Dean White for a long time. He was assistant first team manager when I was coming through the ranks at Brighton (& Hove Albion) and gave me my senior debut against Manchester City. Cook has made more clearances and more headed clearances than any other player in the Premier League this season. The 25-year-old central defender has been an ever-present for the Cherries in the top flight and has chipped in with four goals along the way. 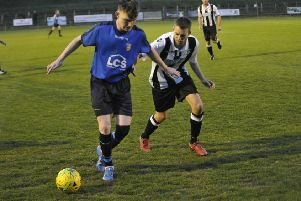 United’s academy is made up of teams in several youth age groups, the oldest of which is enjoying a splendid season in the National League U19 Alliance Division B. That team continued its remarkable unbeaten record in the league this season with a 3-1 win at home to Lewes this afternoon (Wednesday). That was United’s 10th league victory out of 14 and they sit second in the table - eight points behind Maidstone United Ambers with two games in hand. United are at home to Maidstone next Wednesday. United director Dave Nessling said: “The club is extremely pleased and delighted to receive the high profile backing of AFC Bournemouth star, and local lad, Steve Cook for its academy. “Under Skiltek’s guidance (Skiltek is the club’s coaching partner), great strides have been made in a short period of time since its inception only two years ago and the club is convinced that its intention of producing talented East Sussex-based players good enough to play at least Ryman League football will be achieved.